We are at the mid point of the year and looking back, we've introduced several new artists to the gallery so far! Here's a quick summary of all the new to CH artists this year so far. If you would like to receive updates on new artists more frequently, sign up for our weekly newsletter /mailing list on the right of the page. Out of the many galleries that are currently pursuing her, we are honoured to be the first to exhibit her work! We are intrigued by her unique style and how she salvages lath from old home and re-purposes it in her artworks. 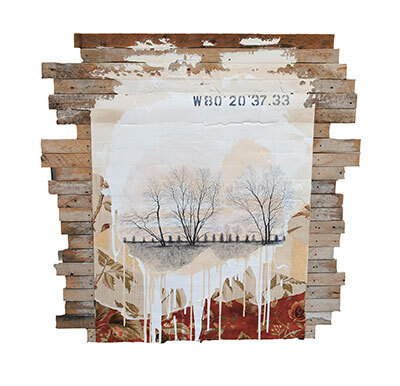 Her work examines time, playing with layers that reveal the imagined history of the reclaimed wood. "I re-purpose the lath that myself and my husband salvage form local home owners . . . I use a variety of plasters, drywall compounds, clear gessoes and acrylics to draw [using graphite pencil]. The tree imagery, based on personal photos taken in southwestern Ontario are meant to stir up involuntary memories of personal experiences with the hopes of reminding the viewer of the importance of respecting our natural environments. The recycling of found materials further support my interest in the environment." Liz Rae Dalton's encaustic sculptures starts with collecting driftwood from near her home on an island in the Gananoque area. Using encaustic as her main medium, she transforms the driftwood into marine vegetation and coral. She is inspired by "what lies beneath the water's surface", including the many historical shipwrecks in her area. "The entire process of creating my encaustic sculpture, from the arrival of driftwood on my shoreline, to the cleaning, carving, and application of molten coloured wax, is a personal journey that speaks about transformation and navigation. I am deeply connected to this work which draws parallels with the journeys that we all take in life." Daniel St-Amant currently works in Toronto, creating his mixed media artworks that utilise objects he has found in nature (such as dirt, moss, driftwood or tree bark). He will also create unique textures from urban settings. One example of this is having vehicles drive over canvases to capture the tire tracks onto the canvas. His goal for his work is to raise questions about how current human activities are encroaching and affecting not only the animals and their habitats, but also the people. He holds a BFA from NSCAD University and a graduate’s diploma from Seneca College at York University in Visual Effects for film and television. His work is found in collections in Canada and internationally. Scroll down for a video at the bottom that shows a behind the scenes look on how he creates his artwork, starting with capturing the tire tracks. The gallery is always looking to expand our collection and introduce collectors to some of the best artists in North America. We are thrilled to be able to carry the delicate yet powerful work of Estella Fransbergen, who currently works out of the US. Estella uses a variety of sculpting techniques, from traditional coil building to modern 3D printing using metals and precious stones to create intricate decorated female torsos in the reminiscent of the oldest fertility statues. "The simplicity of the torso captures the essence of the soul. That, together with the primitive firing techniques of sawdust and Raku, brings me back to my South African roots. The beauty of the colors in the clay is created by the intensity of the fire. Each torso comes from the fire with a uniqueness all its own. This element of surprise and individuality celebrates the human form. 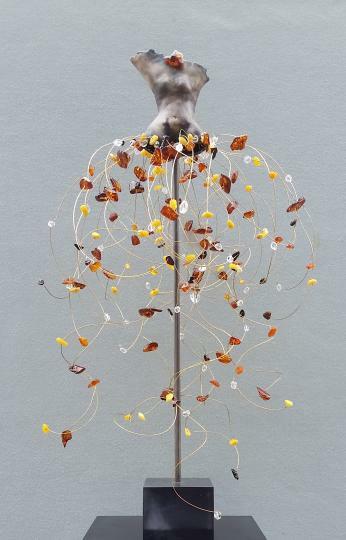 I "dress" the naked form of the torso to represent nature using feathers, branches, leaves, and gemstones. I use semi-precious and rare stones, formed over millions of years. Each stone has a symbolic meaning and our eyes detect the unique beauty of what lies within each." Raku is the method of covering a kiln fired and glazed ceramic with 'slip' (watered down clay), which is left to harden then placed in a sawdust fire. The slip cracks, allowing the fire to burn the glaze underneath, creating surprising patterns on the sculpture. Some artists chose to engrave the slip to create patterns or images. Ruben Fasani studied at the National School of Ceramics, and graduated from the National Technical Ceramic Arts. Throughout his art career, he has made functional objects in ceramic, using a potter’s wheel. As well, he has studied traditional Japanese glazes for both stoneware and porcelain. He then began to create larger-scale sculptures and installations, and researched fusing glass as well as the lost wax process. 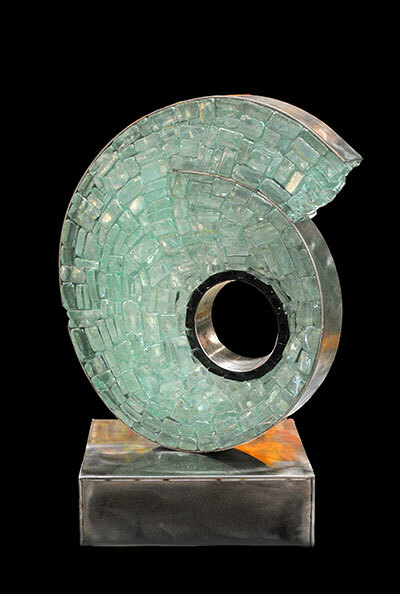 He often works with recycled glass and derives satisfaction from transforming industrial waste into art. He has won several national and international awards in 2000 becoming the Grand Prize of Honor President of Argentina in the National Ceramic Exhibition. His work can be found in both private collections and in international museums.